Every year Freedom Petals puts our financial donations to good use. We raise money through the generosity of our wonderful supporters and volunteers. We also have a great time doing speaking engagements for Lions clubs, Garden clubs, and Women's groups in Virginia and Maryland. We only ask for a $50 donation for our speaking time. It is our intention to use all the moneys' every year before we file our non-profit taxes. Most of the money supplements our donated fresh flowers for events, flower materials; such as corsage wrist bands and corsage ribbons, silk flowers and theme items for each event. The big items we have purchased: year one was a three door florist cooler that has saved our flowers and keeps them at a lovely 34 degrees. They look so fresh for our deliveries. The second year we purchased a working sink for the basement (our florist shop), no more lugging heavy water buckets up and down the stairs. 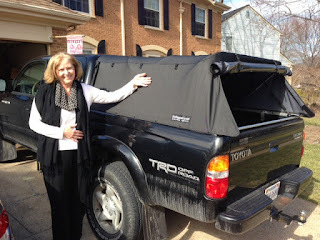 This year we saved our donations to purchased a canvas top for the truck so we can use it for deliveries and also flower pick ups. The top keeps the wind from blowing the flowers away. This is a temporary top that can be snapped on and off. Soooo cool. Its maiden voyage was our February 2013 delivery to WRNMMC. We moved over 60 arrangements with no damages, to Fisher House and the hospital. I thought it was important for everyone to know where the thoughtful donations we so appreciate are used. As always we also appreciate the wonderful hard working FP volunteers and all the vases, ribbons, silk flowers and flower material that we receive. Thanks to my flower partners Anne Harvey of the Herndon Florist and Trader Joe's Reston.